Grizzly Omega Health - Omega-3's is made from wild, not farmed, Alaskan Salmon. This is important because wild salmon has fewer calories and higher in Omega 3. 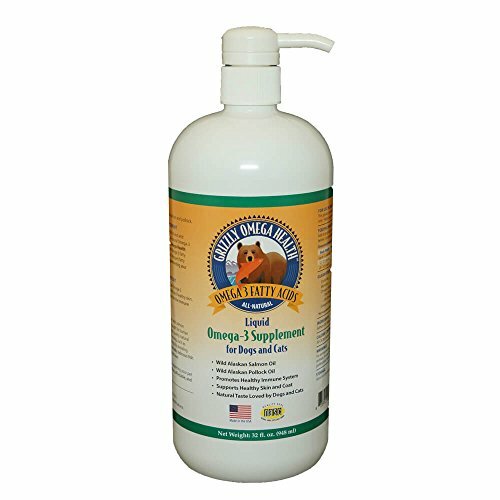 Grizzly Omega Health contains high levels of DHA and EPA to support healthy skin and coat. Grizzly Omega Health also supports nerve-based functions including cognition and vision, immune system and fertility. Contains high levels of DHA and EPA. If you have any questions about this product by Grizzly Pet Products, contact us by completing and submitting the form below. If you are looking for a specif part number, please include it with your message. Petvi all natural probiotic PLUS hip & joint nutritional supplement, gives your dog a shinier coat, healthier skin, a strong immune system and helps with digestion and joint related problems.